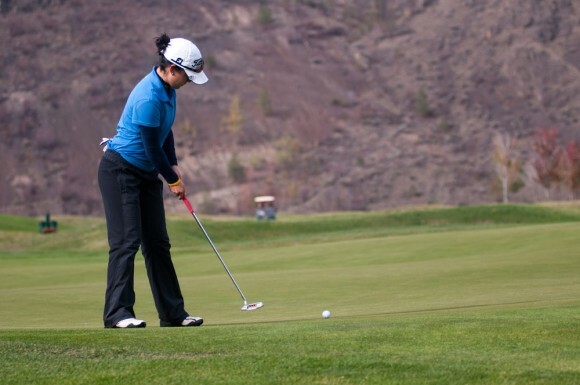 The UBC Okanagan Heat women’s golf team finished second after the three-day Ping/CCAA (Canadian Colleges Athletics Association) Golf National championship held at The Dunes at Kamloops Oct. 12 to 15. This is the second year in a row that the women’s golf team has taken home a national silver medal. Jen Woods and Alana Kent represented the Heat in the team competition, with Martina Osman playing as an individual. The first day saw the two-member team finish second in the overall standings. Woods was in fourth shooting an 81, and Kent shot an 89 --good enough for 11th place. Though disappointed with their scores on the first day, Woods and Kent were able to use the experience gained from last year's national tournament -- focusing on the fact that the tournament is three days of competition and that the extra day would enable the golfers to make up those strokes. Day two of the tournament saw both players pick up their game as they both shot a 79, tied for second-best on the day. Although the golfers shot well they still trailed the Durham golf team by 13 strokes. In the final round, the national silver medal was a likely outcome as they carried a 24-stroke lead on the third place team, and that allowed the players work on individual performances. Woods finished in fifth place with a two-day total of 160, just only three strokes back from second place. 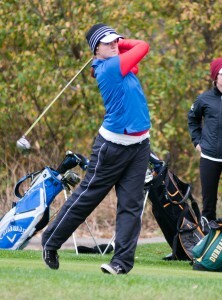 Kent carried a two-day total of 168, alone in fifth place by eight strokes. Looking to capture second place, Woods played a great front nine as she was paired up with Durham golfer Tiffany Albath, who was in second place at the start of the day. Woods overtook Albath early in the final day with some great work on the greens, but went through a bogey spell at the same time Albath had a streak of birdies, and the golfers finished in the same order they began the day. Coach Adrienne Vedan was proud of her team’s accomplishments. “It is great for these girls, they went out there and finished fourth and fifth playing against 26 of the top collegiate golfers in the nation,” said Vedan. The Heat men’s team -- Keith Martin, Nik Jmaeff, Luc Chase, Harvey Hubbell, and Will Deck -- finished 12th at the three-day completion with a score of 932. The top finisher for the Heat men was Keith Marin, finishing 12th with a score of 223. Coach Vedan said the experience of being at a national competition help the golfers prepare. "This being the second time around, we were able to take advantage of creating a better time-management strategy with the tournament schedule," she said. "For example, we left a day earlier and were able to practice at the Dunes facility to gain a better feel of the greens and conditions, as well as play an additional practice round.